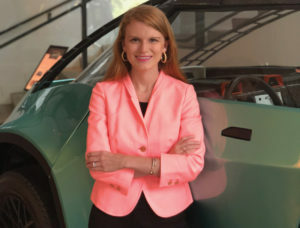 Amy Tinsley, head of the South Carolina Automotive Council, learned an important lesson from her father, who has influenced not only the way she looks at the world, but her strong sense of values. That philosophy, one of many things he taught her, serves her well in her leadership position. Tinsley’s strong paternal figure is a self-taught engineer who works on large industrial projects, bidding jobs based on his assessment of the construction needs or equipment upgrades. He not only taught his daughters a strong work ethic, he spent the extra time in showing them what makes something tick, bringing the manufacturing industry to life in a fascinating way. Seeing her father build their home in Camden, South Carolina, was especially enlightening for the young girls as their dad worked with reclaimed materials before it became trendy. Besides gaining that appreciation for history from her father, Tinsley said, watching him afforded her a fascinating perspective of the construction world. Seeing her father pour over intricate building designs piqued her interest and has made her savvy enough to fix those annoying little home maintenance projects that crop up, sometimes with her dad on speaker phone to guide her through the more technical points. More importantly, witnessing her father’s large-scale projects and having an idea of the minute details that go into making such operations successful set her up for success with the sort of long-term commitment it takes to work with an organization like the SCAC. In college, Tinsley served as an intern at the South Carolina Manufacturers Alliance — the SCAC is a division of SCMA — furthering her understanding of what is involved in manufacturing. Working with a utility like Duke Energy broadened her horizons in seeing the many facilities involved. “Of course, a lot of our largest manufacturers are the utility’s largest customers, so seeing it from that side of automotive manufacturing and manufacturers as very big users of power … you understand that their business is critically impacted by the utility business,” Tinsley says. Seeing how businesses are intertwined shows “how important it is they have the resources they need in order to do their job and complete their products. Whether it’s a completed vehicle or a component part, it all ties back together,” Tinsley says. In her role with SCAC, Tinsley visits OEMs and suppliers to ensure she’s up-to-date on numbers, issues and needs in the industry. “We spend a lot of time just connecting with our members and trying to make sure we know what’s going on and what they need,” Tinsley says. Setting the stage for manufacturing and technology careers earlier and earlier in students’ lives is a way to help them realize automotive jobs are high paying and as strong career development pathways, she says. “Staying at the forefront of workforce development is our biggest challenge and making sure that we continue to meet and exceed expectations with that,” Tinsley says. She references Future Makers, a partnership between the SCMA, the state and the departments of Education and Commerce as an example of what South Carolina is doing to stay ahead of the curve in training and recruiting the future of the industry. Beyond that, though, Tinsley wants to see SCAC on the frontlines of the state’s automotive industry efforts. “We want to be a leader in sharing ideas and through leadership, making sure that people are having opportunities, whether through our events or our meetings,” Tinsley says. “We like to stay engage and abreast of what is going on. We want to provide value to them, and we want to be at the forefront of what’s going on in the automotive community. Never one to be idle, Tinsley’s a big believer in continuous education. A graduate of Presbyterian College, she went on to earn two more degrees: a master’s degree in public administration and a master’s in business administration from the University of South Carolina.